Ready for spring? At my house, that means all five of us will have allergy issues of some kind: my husband gets hay fever, my daughter gets hives, and three of us have strong reactions to pollen and grasses. I have to keep up with our ongoing maintenance as well as be prepared for allergic reactions that happen when we’re out together. 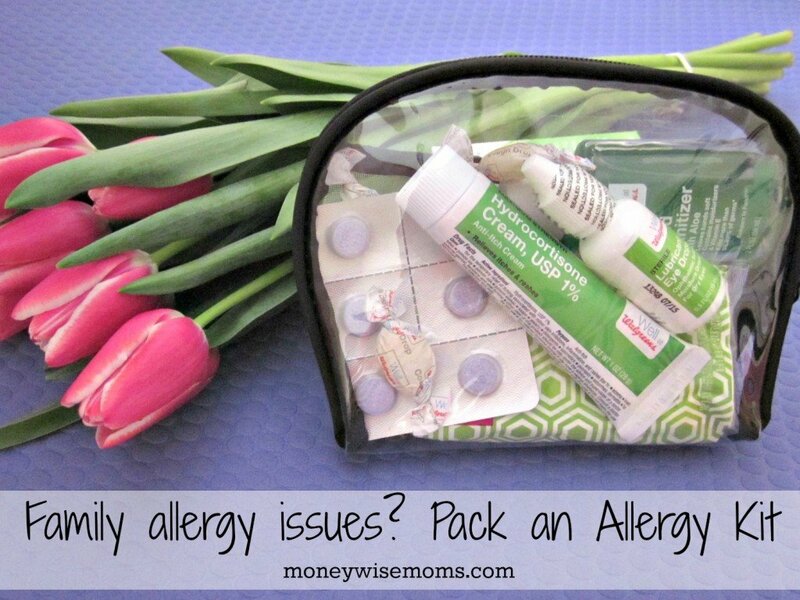 That’s why packing an allergy survival kit is one of my spring tasks. 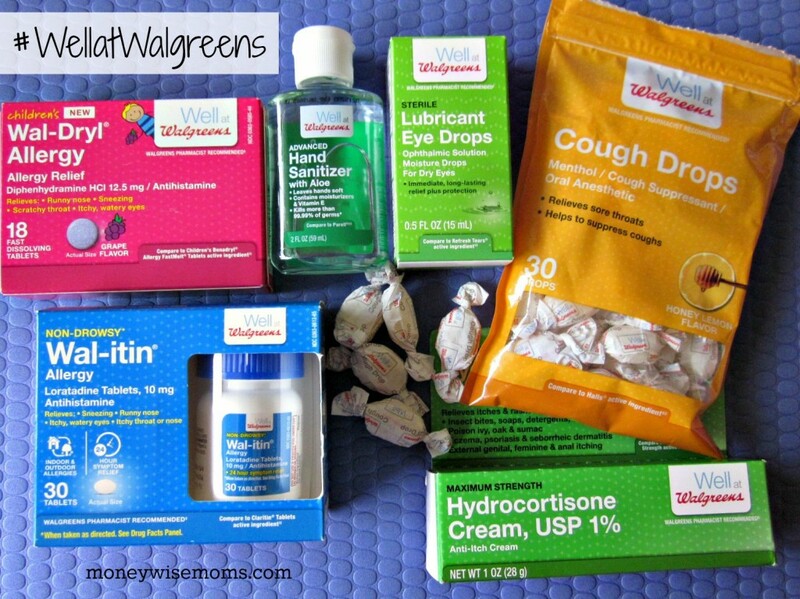 I made a trip to my neighborhood Walgreens where I was able to find everything I needed in one store, in just one trip–score! Plus, all March, the Well at Walgreens products are Buy One, Get One 50% off–score again! I also earn points as a Balance Rewards member (not a member yet? It’s free to sign up) which will give me a discount on my next purchase. 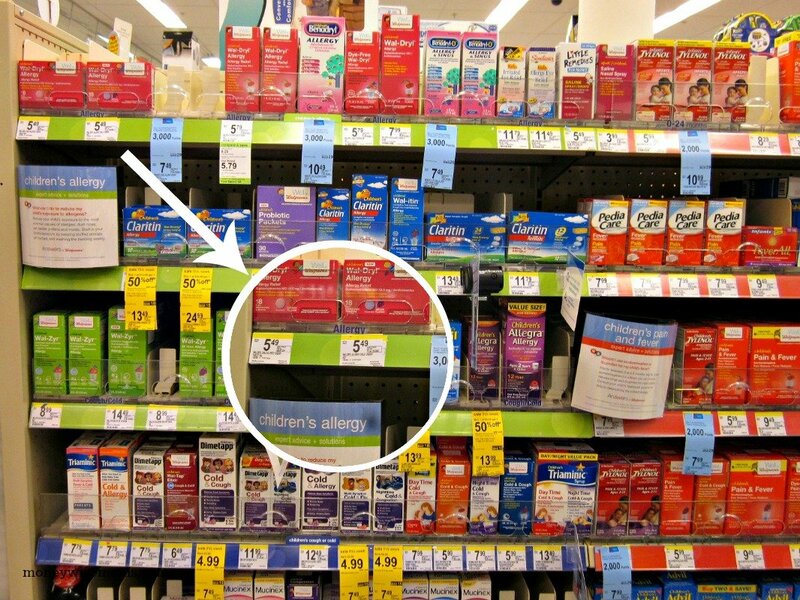 I’ve found the store brand–Well at Walgreens–to work just as well as the more expensive name brand maintenance medications, so look for Wal-Dryl, Wal-Zyr and Wal-itin in the Cough + Cold + Allergy aisle. For acute problems, we like to have cough drops on hand for the itchy throat you can wake up with due to post-nasal drip (ugh). I like allergy eye drops for myself, but I prefer to use the “simply tears” version on my kids, just to flush out any pollen or substance if they’re having a problem there. 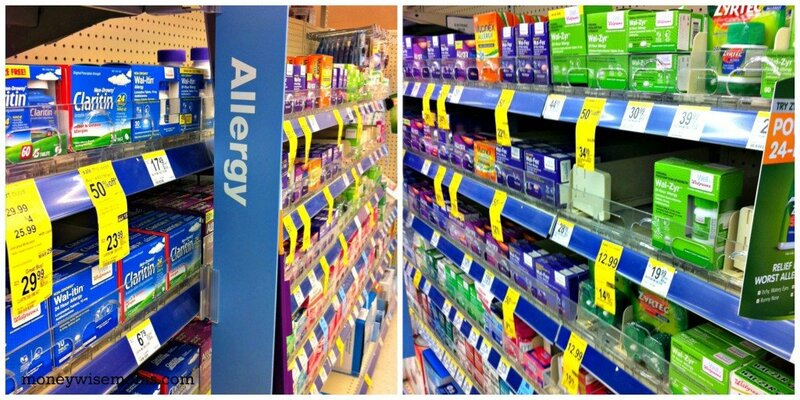 It was a little tricky finding the eye drops; they weren’t with the allergy medications, but around the corner in their own section. I found the fast-acting kids allergy medication I was looking for in the Children’s Medication aisle. I carry these quick-dissolve chewables whenever we’re out and about because they’ve worked for my kids before to tame a bad insect bite reaction or sudden hives. While you’re shopping, don’t forget basics like hand sanitizer and tissues. 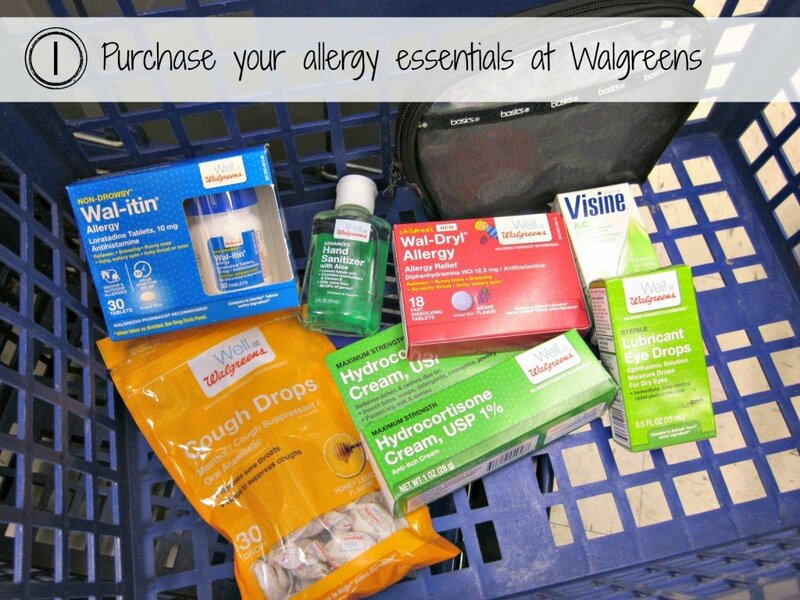 We take those on every family outing, so they’re a great addition to the allergy kit. Look around the cosmetics area, on the perfume kiosks, for the zipper bags. 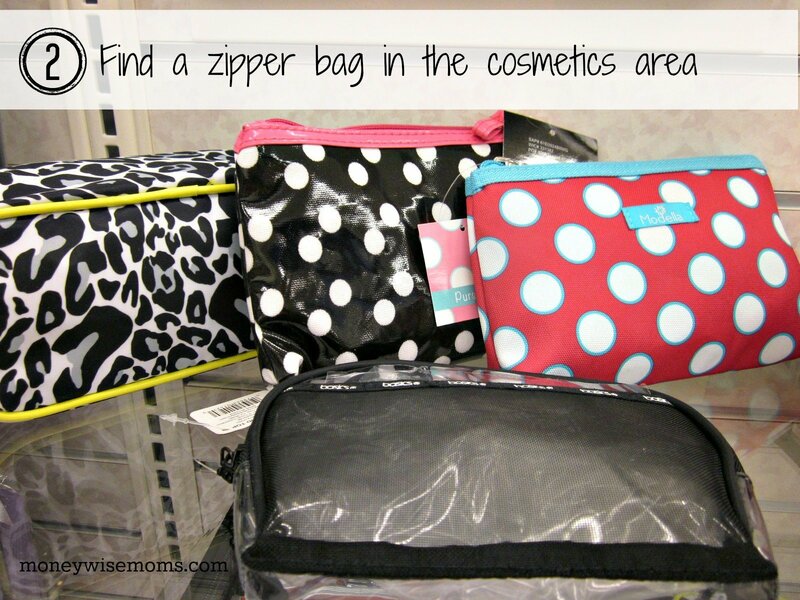 I found a great selection, including these cute polka dot bags! Choose one to fit your products from Step 1 but small enough that you can carry it in your purse, diaper bag or backpack. Even though I loved the pink polka dot bag, I chose a clear bag so that anyone traveling with us would know at a glance what they were grabbing (if I had to send someone else into my purse or backpack, like one of my kids, they’d know they had the right thing immediately). 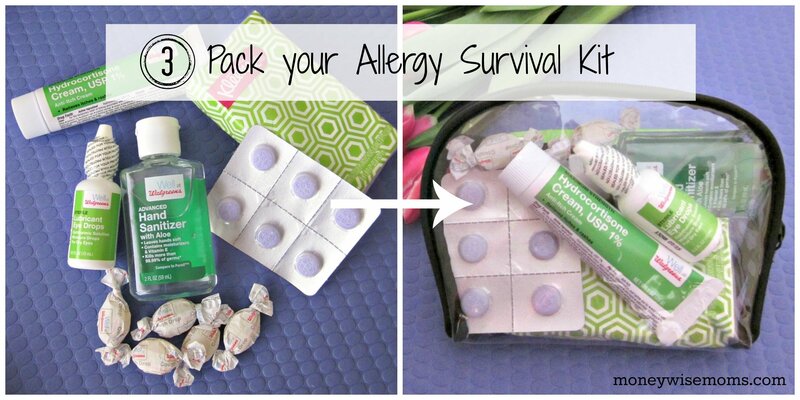 Put your allergy survival kit together. I filled my allergy survival kit with products to help us with sudden allergic reactions–eye drops, tissues, chewable tablets and anti-itch cream–while we’re out doing family activities. 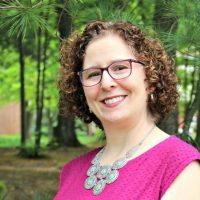 Now, we won’t be bothered by discomfort when we’re doing day trips to botanical gardens, hiking and other outdoor adventures this spring. I keep our ongoing maintenance medicines in a little basket near the dinner table, so we remember to take them nightly. With the Walgreens Way to Well Commitment, 1¢ from the purchase of every Walgreens Brand Health & Wellness product, up to $3 million annually, will support bringing preventative wellness services to local communities through the Walgreens Way to Well Commitment®. To learn more about this campaign, follow #WellAtWalgreens. I always carry the Walgreens brand Benadryl with me in case of allergies. My son has had a few issues with foods and I don’t want to be caught without it. I love the idea of carrying a whole kit. Great suggestions! Good idea! I was just thinking about picking up new first aid items for my car kit. I should add in some allergy items, too, just in case we need them. What a great idea! I love using the cosmetics bag to have everything right at hand when at work. Brilliant!